It is no wonder the public is confused by “detox.” As a practitioner, this reminds me of the battle that wages on between food allergy and food sensitivity. Technically, very different mechanisms are at work between the two but practically, the two have a lot in common. Addiction medicine uses detox to describe the initial medical management of abuse of alcohol, drugs, or other addictive substance or behavior and the physical recovery of the patient.1 In this context, there are three recognized steps including evaluation, stabilization, and the patient into treatment.2,3 This definition is a far-cry from what most detoxification programs and products are designed to do, yet similar nomenclature exists between the two (and perhaps even others). Tom Wells, a chemist from the Voice of Young Science (VoYS) out of the UK commented that two things are required by any proponent of detoxification programs or products – a clear understanding of what detox is and evidence that the product/ programs does what it means to do.4 The public and our patients have a right, to the best of the available science, to know what we mean when we use the term detox and what we expect the programs or products to do. It is hard to imagine a make-up remover having the same detox value as nutrients or herbs that support the liver. Our definitions require refinement. Biotransformation: conversion of a compound to a slightly different compound in the process of degradation. Metabolic detoxification: natural function of the body to degrade compounds and prepare them for storage, excretion, or recirculation. Differs from biotransformation as it refers to a constellation of reactions rather than just one. 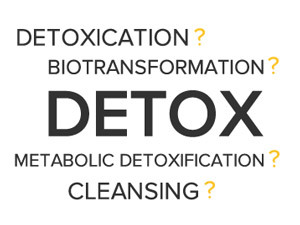 Cleansing: often used interchangeably with detox with integrative practitioners. This term has been extended to many cosmetic products to really just mean clean. May also be used in context to mean supporting excretion through the kidneys, colon, or both. Detoxication: a term yet to be incorporated into the vernacular of integrative medicine. The processing and elimination of toxins from the body; suggested to replace detoxification as to not confuse with substance abuse treatment. It is the opposite of intoxication. Detoxification: a wildly confusing term for the public when not given extensive context and specific functions and outcomes. The human body has a system of detoxication for those chemicals that we ingest or absorb on a daily basis This system involves complex processes of the liver and kidneys with support from the gastrointestinal system. So, this calls into question which chemicals are truly harmful in any amount, which ones we can handle in modest amounts, and finally how much total load can a normal body tolerate. The total load question is another good one when the subject of said total load is already compromised. Detoxification, when used in this context, is occasionally questioned by the public or other professionals. Do the liver, kidneys, and gastrointestinal system need additional support over and above what is normally found in the diet? The prudent answer is probably, “It depends.” The enzymes that are responsible for the previously mentioned complex processes require co-enzymes and co-factors (vitamins and minerals). The activity of enzymes can be induced to some extent but also has genetic influence. Variation exists between individuals as evidenced by medication intolerances now likely suspected to be the result of genetic polymorphisms. Further, we can now, at least in part, identify which genetic factors affect certain enzymes. Some diet and lifestyle factors have epigenetic effects on the organism. From a mechanistic perspective how well this system works certainly changes based on the volume (total load) it is required to process. So, “It depends” isn’t a cop-out. It’s a responsible answer. 4 Paddock, Catharine. "Debunking The Detox Myth." Medical News Today. MediLexicon, Intl., 5 Jan. 2009. Web. 25 Mar. 2014.